1. Click on the Start button in the bottom left corner of the screen. From the menu that appears, click on Run. 2. 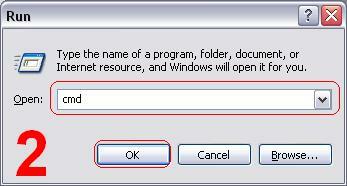 In the small window that appears, type in cmd and click on OK.
3. A black window with white writing will appear. 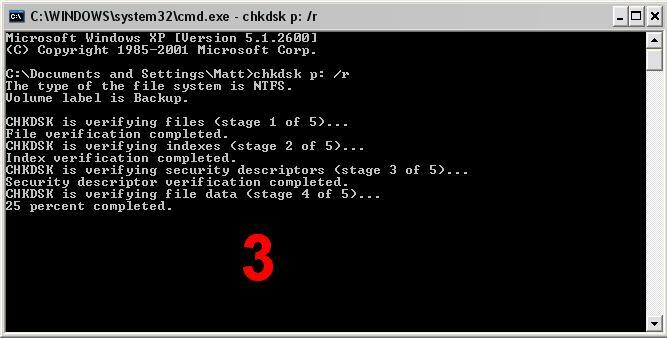 Type in chkdsk x: /r (where x is the letter of the drive to be checked) and press enter on the keyboard. Messages similar to the ones in the screenshot below should appear. The check should complete five stages. Note: This process can take anywhere from a few minutes to a few hours, depending on the capacity of the hard drive being tested. 4. At the end of the process, a summary of the check will appear. It should state if any problems were found and fixed. Note: Look carefully at the number of KB in bad sectors. Bad sectors are areas of the drive which have become unusable. Development of bad sectors can be a sign that the drive is failing. If there is more than 8KB in bad sectors, I would advise replacing the drive if it is used for important data. If this is not an option, run the check periodically to make sure the problem isn't getting worse. It is very important to have a backup of any data on the drive, as it could fail spontaneously. 5. 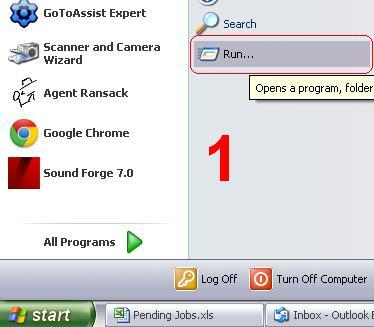 Click the cross in the top right corner of the screen to return to the desktop.